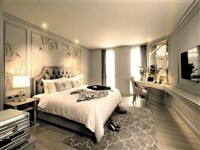 If you are searching for a new hotel in Bangkok, Thailand, below is our list of the latest new accommodation opened recently, with all the best luxury hotels and resorts, to more affordable 4 and 3 star properties. 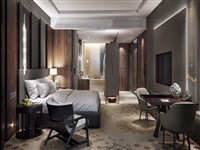 This new ultra-luxury hotel in downtown Bangkok opened on the 31st of March 2019. 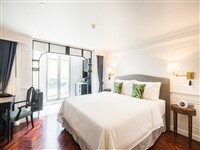 The hotel occupies a newly built 30 storey building, connected to Ploenchit BTS station, in the upscale Embassy district of the city. 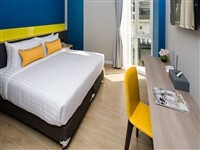 A new 3 Star hotel in Bangkok opened in February 2019, located close to the Sanam Pao BTS station. This brand new property offers 91 modern guest rooms, a café, gym and a bar. 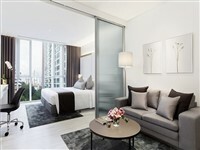 Opened in mid-January 2019, this new 5 Star hotel in Bangkok's trendy Thonglor district, is located on Sukhumvit Soi 55 (3 minutes walk from Thonglor BTS Skytrain), offering 301 guest accommodations, an outdoor pool, gym, choice of restaurants and a pool bar. 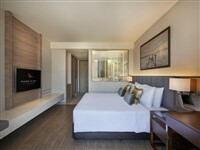 The 5 Star Hyatt Regency is a new hotel in Sukhumvit, Bangkok, opened in December 2018 and is connected to the Nana BTS station. This luxurious property features an outdoor pool, pool bar, fitness centre and a range of upmarket food and beverage outlets. 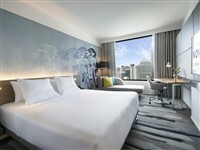 A new 4 Star "Concept Hotel" in Bangkok city centre located close to Victory Monument, offering 142 rooms and suites, a restaurant, rooftop pool and pool bar. This recently opened new Sukhumvit hotel offers 78 modern rooms, a rooftop swimming pool, gym and all day dining restaurant. A new luxury hotel in Sukhumvit 59, 5 minutes walk away from Thonglor BTS Station, featuring an outdoor swimming pool, spa, fitness centre and a restaurant. This new 4 Star hotel in Sukhumvit, Soi 7, opened in mid-November 2018, offering 75 guest rooms and suites, a rooftop pool, gym and restaurant. Recently opened on the 1st of October 2018, this new 4 Star hotel in Sukhumvit by Accor Hotels, offers a good location, just a short walk (600 metres) away from Nana BTS station. 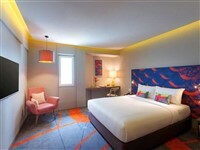 The newly built Novotel, shares amenities with the new ibis Styles (see below) which is part of the same building. 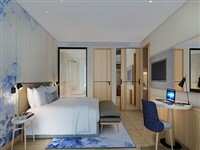 Also opened on the 1st of October 2018 by Accor Hotels, this new 3 Star hotel in Sukhumvit offers 133 good value rooms and shares amenities (pool, fitness centre, restaurants, rooftop bar) with the more upmarket Novotel Hotel (see above). 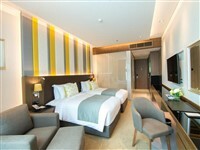 This new 4 Star hotel in Ladprao is located next to the Phahon Yothin MRT Station and just across from Union Mall. The property offers stylish guest rooms, an outdoor pool and a gym. This brand new 4 Star hotel in the Sukhumvit CBD has recently opened on the 28th of September 2018, offering Studio and One-bedroom serviced apartments. 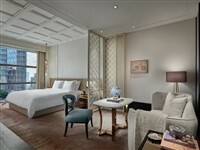 The new luxury Waldorf Astoria Bangkok opened in August 2018 in the CBD of the city. 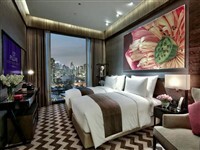 Luxurious guest accommodations start with the spacious 50 sqm King Deluxe rooms, to a range of ultra-luxurious Suites. The property features an outdoor swimming pool, Spa, six restaurants (including a rooftop restaurant) and two bars. 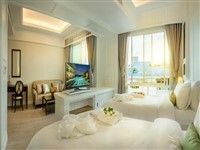 A new small hotel near the Khao San Road area of the city, offering guest rooms that feature a private jacuzzi in each room, a rooftop swimming pool, gym and an on-site restaurant. 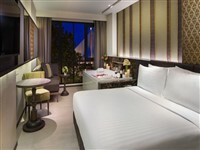 A new hotel in Pratunam, Bangkok, this 3 Star property is located right next to the famous Pratunam market. 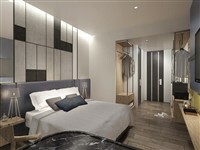 This new luxury hotel in Bangkok recently opened in June 2018. A new 5 star luxury boutique hotel, the property is located in the lively area around Sukhumvit Soi 20, offering 50 guest accommodations. Opened on the 1st of June 2018, this new 4 Star accommodation is located along New Phetchaburi Road, with 70 guestrooms, a rooftop swimming pool, gym and an on-site restaurant. A new deluxe hotel in Bangkok opened in mid-2018, located in front of the Phya Thai station, where you can take the BKK Airport Link train and BTS trains around the city. 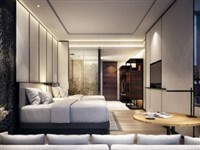 A new 5 Star Bangkok city centre hotel recently opened in April 2018 offering a range of luxurious guest Rooms, Suites, two and three bedroom apartments. The property features an outdoor infinity pool, spa, fitness centre, a range of international restaurants, a rooftop bar and a pool bar. 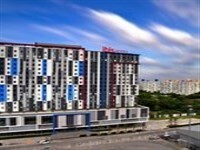 A new hotel near Pratunam Market in the centre of Bangkok located close to the Ratchaprarop Airport Rail Link Station and Phya Thai BTS Station. This luxury 5 Star accommodation features two restaurants, a rooftop bar, rooftop pool, fitness centre, library and a culinary school. 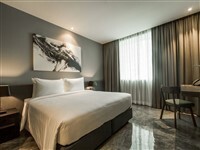 A new 4 Star hotel opened in March 2018 located on the banks of a Khlong (canal) in the old part of the city, close to the popular Khao San Road area. 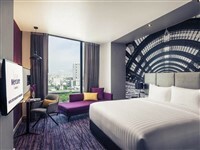 This new hotel close to the embassy area of Bangkok (Sathorn) opened in early 2018, offering 101 guestrooms and featuring a rooftop pool and bar, and a gym. A new hotel near Suvarnabhumi International Airport (BKK) opened in early 2018. This new 5 star hotel in the Sukhumvit area of Bangkok opened in November 2017 and features a rooftop lap pool, fitness centre, two on-site restaurant and two bars. A new trendy, stylish boutique hotel opened in late 2017, located along Rama 9 Road. 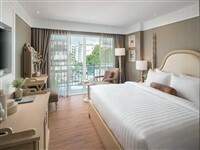 Formally the President Solitaire, this new 4 star hotel in Sukhumvit has undergone a full refurbishment. This new small hotel in Bangkok offers just 14 rooms (including a couple of Suites) and is located on Sukhumvit Road (Soi 20), 10 minutes walk away from Asok BTS train station. 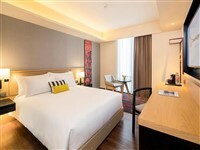 A recently opened (November 2017) new 3 star hotel in Sukhumvit, Bangkok, located close to the Nana BTS train station. This good value accommodation features a swimming pool, gym and an on-site restaurant. A new 4 star hotel in downtown Bangkok opened in October 2017 featuring an outdoor swimming pool, gym rooftop bar and an all-day restaurant. A new serviced apartment hotel in Bangkok opened in late 2017, located on Sukhumvit Soi 39 (close to the Samitivej hospital), offering a total of 88 units, ranging from Studio rooms, to one, two or three bedroom apartments / residences. 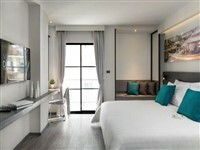 A new boutique hotel in Bangkok opened in late 2017, located on Sukhumvit 97 in the Bangchak area of the city, a short walk from the Bangchak BTS station, offering a range of stylish rooms, pool, gym and a restaurant. This new 85 room accommodation opened in October 2017 in the popular city centre area of Sukhumvit. The hotel offers a rooftop swimming pool, fitness centre, bar and an all-day cafe. This new hotel near the Khao San Road area has recently completed a renovation (formerly the Viengtai Hotel) and offers good value accommodation just a few minutes walk away from this popular backpackers area. 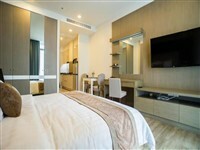 A new apartment hotel in Bangkok located just a few minutes walk away from the Ekamai BTS station. The property offers larger than average accommodation, ideal for families and groups, with apartments ranging from Studio's to one, two and three bedroom apartments. The latest new luxury hotel to open in Bangkok (opened in May 2017), this top hotel offers a good location along Wireless Road in the Lumpini area of the city, next to the Central Embassy shopping mall. This new luxury hotel in Sukhumvit opened in April 2017 and offers stylish luxury accommodation in the heart of the city and features a rooftop pool, gym, a bar, tea room and an all-day dining cafe. This new 4 star hotel in Bangkok opened in April 2017 and is located close to Makkasan Station, where you can catch regular trains to Bangkok International Airport. This new hotel in Bangkok (4 star) in the popular Sukhumvit area, opened in March 2017 and is located close to the On Nut BTS station. 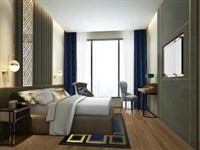 This new suites hotel in Bangkok is located in Thonglor, opened in February 2017. The luxury residence offers a rooftop swimming pool, fitness centre and spa. This new 3 Star accommodation in Bangkok opened in February 2017 and is located in the IMPACT Muang Thong Thani area, just a short drive away from Don Muang International Airport (DMK). 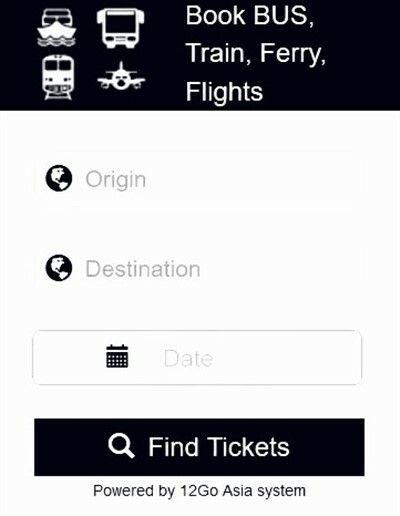 Be sure to visit this page again where we will be adding all the newest Bangkok hotels, as and when they open.